Photo Credit: Rich McGervey/CC BY. 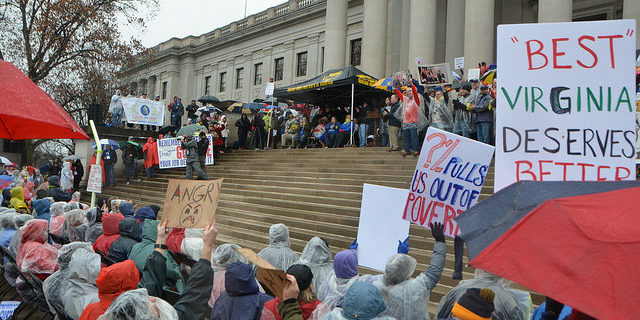 In late February, teachers in West Virginia went on strike in all 55 counties. They possessed no collective-bargaining rights while it was technically illegal to strike as public workers under state laws. With their unions institutionally weak, the teachers self-organized at the grassroots level. The teachers, largely consisting of women, ultimately looked to each other to collectively challenge the injustices they were facing. With some of the lowest pay-rates in the country, teachers won a 5% raise for not only themselves, but all state workers. Why should the food movement and those who combat systemic hunger be looking closely at the momentous struggle of the teachers and other forms of labor organizing stirring around the country? Even before and during the strike, teachers who were fighting for the well-being of their own children took it upon themselves to ensure that impoverished children were fed as they would miss their one certain meal of the day due to school closures. The author of Nickel and Dimed, Barbara Ehrenreich, succinctly conveyed the moment as representative of “our dystopian welfare state: severely underpaid teachers trying to keep poverty-stricken kids alive.” Nearly a quarter of children in West Virginia currently live in poverty. In the United States and the world, hunger is driven by economic and other forms of inequality marked by low incomes, an uneven distribution of wealth and resources, and poverty. Simply put – people cannot afford to eat or to at least eat healthy food. According to the USDA, in 2016, 41.2 million people were considered food-insecure in the U.S. 40.6 million Americans were also living in poverty. Decades of austerity-driven politics and draconian attacks on the welfare system, public-sector employment, and the working-class have created systemic precarity for so many. The past 40 years have culminated to reach new absurd heights with the bank bail-out during the Great Recession, the recent tax reform (scam), and potential further cuts to housing, SNAP, and other forms of social welfare. Our nation’s current form of redistribution ultimately flows upwards rather than down; it is an inverted version of Robin Hood. In a world and nation of plenty, people go hungry because of our social and economic system. It is a political problem, not technical one. Poverty, precarity, and continuous commodification and privatization of food, housing, healthcare, and other aspects of life are being steered by market-oriented politics and economics built upon a systemic need for profit accumulation. 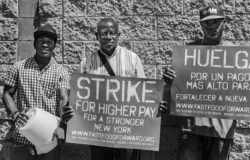 The battles of low-wage, precarious, and devalued workers against exploitation and oppression ultimately have deep implications for the food system. Through collective organizing, we can begin to seriously forge a democratic economy and society where people have control and sovereignty over their lives. The food system and the fight against inequality are deeply interwoven. Collective organizing can reshape the inequality of power and wealth to challenge the systemic injustices driving hunger and diet-related diseases. These issues are magnified even further among communities of color and women. In 2016, 9.3% of white households were food insecure compared to 22.5% of Black-households, and 18.5% of Latinx households. Households headed by single mothers endure food insecurity at a rate of 31.6%. These rates correspond with the rates of poverty in the United States. Simultaneously, the lowest wage jobs in the economy are disproportionately held by people of color and women, many of these in the food service industry. The issues of class, race, and gender are interlinked. Black Americans currently have disproportionately higher representation in private-sector labor unions than other groups even though these unions now represent a fraction of the workforce. Historically, unions have been essential for Black Americans to lessen the wage-gap while also being protected from private-sector discrimination. However, deunionization and deindustrialization over the past 40 years curbed many of these advances; these processes hurt all workers, but especially Black workers. The public sector, which has been a pathway towards the middle-class for Black workers via public sector unions, has been under attack for decades; currently, the Supreme Court case Janus V. AFSCME may further diminish the power of organized labor in the public-sector, disproportionately affecting the Black community. It will take an organized and collective effort of solidarity to not only challenge the dire situation, but to dismantle this material form of racism experienced by millions of people of color. Meanwhile, even with recent falling unemployment, wages have remained remarkably stagnant while cost of living has soared – a trend that has continued since the 1970s despite rising productivity. Workers are doing more with much less. Many of the new jobs being created have been low-wage and undervalued. Monopolistic corporations such as Walmart, Amazon, fast-food chains and others are concentrating power and producing profits while their low-wage and precarious workers must rely on food stamps to make ends-meet. Instead of providing regular hours and dignified wages, these corporations, among others, profit off the precariousness, low wages, and tax cuts which are then effectively subsidized by the public. Ironically, subsidies are as popular as ever, just as long as they don’t go to poor people in the form of non-marketized housing, healthcare, or food, without cutbacks or severe restrictions. For too many American workers, the workplace reflects a massive imbalance of power where there is no form of democratic control. Fates are determined in a dictatorial manner by bosses and the whims of the market economy. Similarly, too many people suffer from the absence of democratic control over our food systems and the severe concentration of power from corporations and market-driven, governmental policy. It is our social and economic system which concentrates power in the hands of a small, elite minority. Yet, all across the country and the world, this dismal system generating inequality in all its forms is being boldly and collectively challenged. Within a capitalist system where most of us can only survive by selling the value of our labor to those who control and own property, cross-racial and gender solidarity is essential to begin to build a movement to disrupt and transform our systemic inequality and poverty driving hunger. Dismantling inequality will necessitate a massive change in the way wealth and resources are distributed throughout society which can come through organized power as we have seen historically and recently. A reinvigorated labor movement can be a major catalyst to the political movement to de-commodify food, housing, education, healthcare, and other material needs of daily life. From the nation-wide fight for 15 and rising immigrant worker organizing, to striking graduate students, teachers, and more, workers are organizing and struggling to transform the inequalities at the root of hunger. There is more than enough food, wealth, and resources to create a more equal society. A politicized labor movement will help us get there.